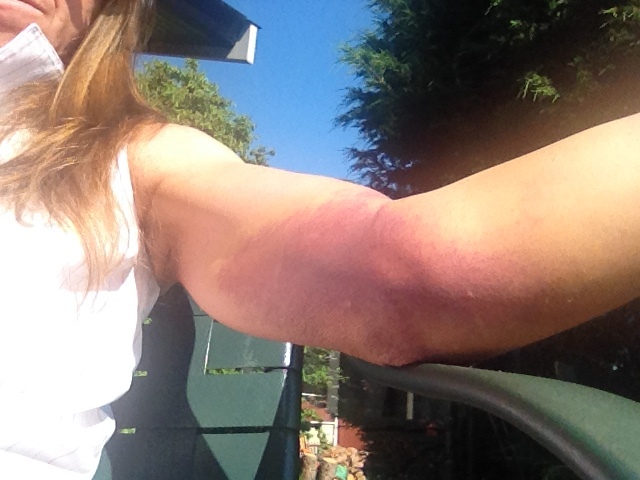 So it turns out that the double dislocation of my elbow was the lesser of two injuries. Because it was a double dislocation (both bones shot out of place) apparently the risk of re-dislocating is slim. This is good news. The damaged joint capsule should heal nicely in about 12 weeks, which I had thought was terrible news until I visited my physiotherapist who informed me that I had done some major tearing damage to (possibly complete destruction of) the ligament that essentially attaches the top part of my arm to the bottom part. “You should know by Christmas if it looks like that’s going to heal on its own,” he said blithely. I nearly fell off the examining table! If it heals. If the ligament is so far gone it can’t knit itself back together, then reconstructive surgery is an option – a procedure called Tommy John Surgery. The procedure seems to be fairly common in pitchers who regularly rip apart their elbows and, oh joy, within a year of the surgery the prognosis is pretty good. I could barely keep reading when I learned that this surgery requires removal of tendon from somewhere else in the body in order to create a new connective bit in the elbow – where on earth would they find a spare bit of tendon to use????? 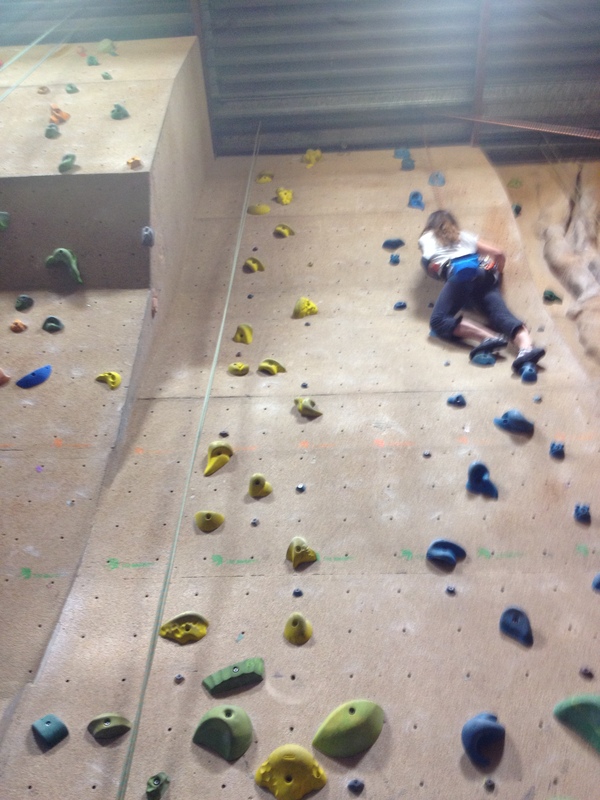 To his credit, he didn’t laugh at me or say (like the orthopedic surgeon) that climbing was out of the question. We discussed options. There are some pretty good braces out there – terribly expensive but which limit the lateral movement of the elbow joint and prevent hyper-extension during the extended healing time needed for the soft tissues to repair themselves. 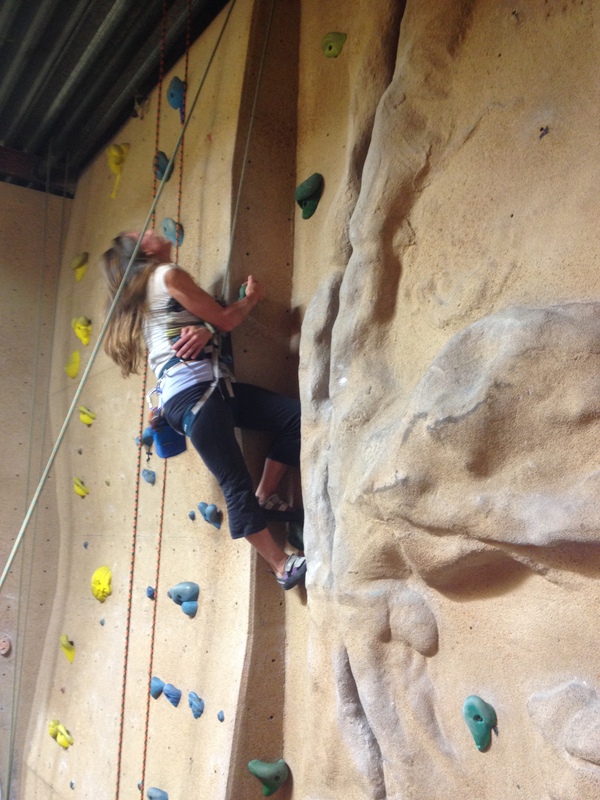 I suspect there wouldn’t be a lot of pulling power in the left arm, but having a second arm is kind of essential when climbing, if only to pinch and grip and balance while moving the other, fully functional arm into a secure position. Or, is it? 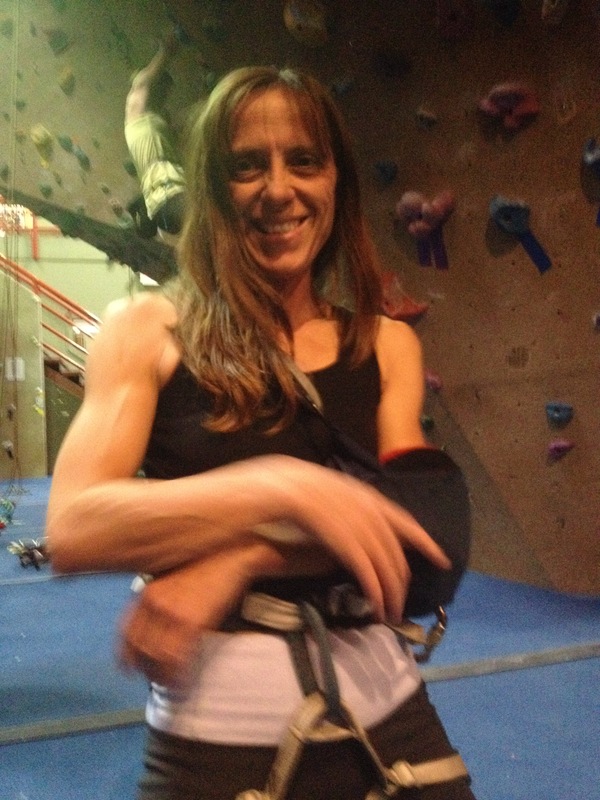 It occurred to me that other people had likely dealt with arm injuries, that there are para-climbers out there who climb with fewer than a full complement of limbs… I asked about immobilizing the injured arm and climbing with the other one and we decided that there was no harm in trying as long as I was securely top-roped and didn’t do anything foolish like bouldering. Which is how I wound up stuffing an oven mitt into the pocket of an ice-holding wrap designed for icing an injured knee, wrapping that around my elbow for padding, stuffing all of that into the sling they gave me at the emergency room on the first night and then securely fastening the sling and padded arm snugly across my torso. I was a bit worried about falling off the wall and catching the sling on a hold, getting hung up and dislocating my shoulder or hanging myself or something equally ridiculous, so my wonderful climbing partners helped me squeeze into a very tight t-shirt so all loose bits were covered and I was unable to move the sling, my arm or get caught up in anything in case of a tumble. 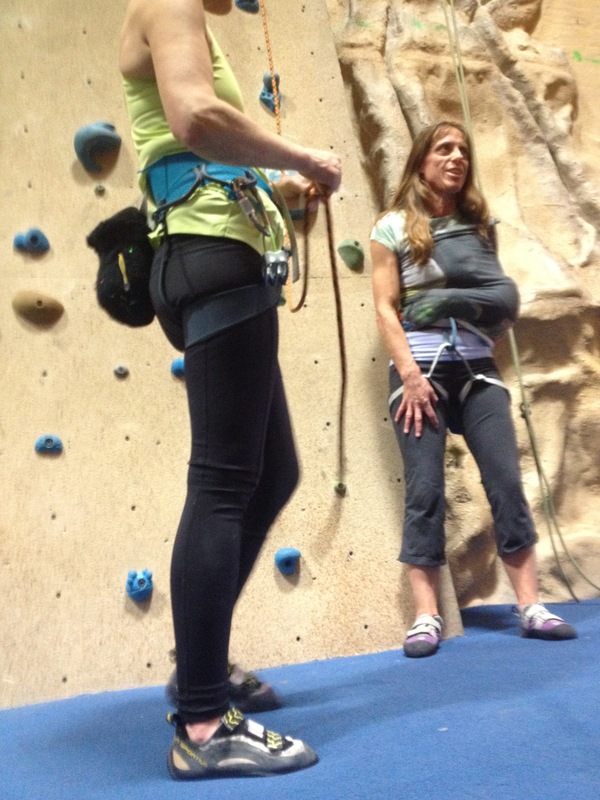 Add the two of us together (Charlotte has a broken foot) and you might wind up with one decent climber! In the end I was so trussed up it felt like I was wearing a straight jacket and couldn’t even manage to tie in by myself. Once securely fastened to the top rope, it was do or die time. 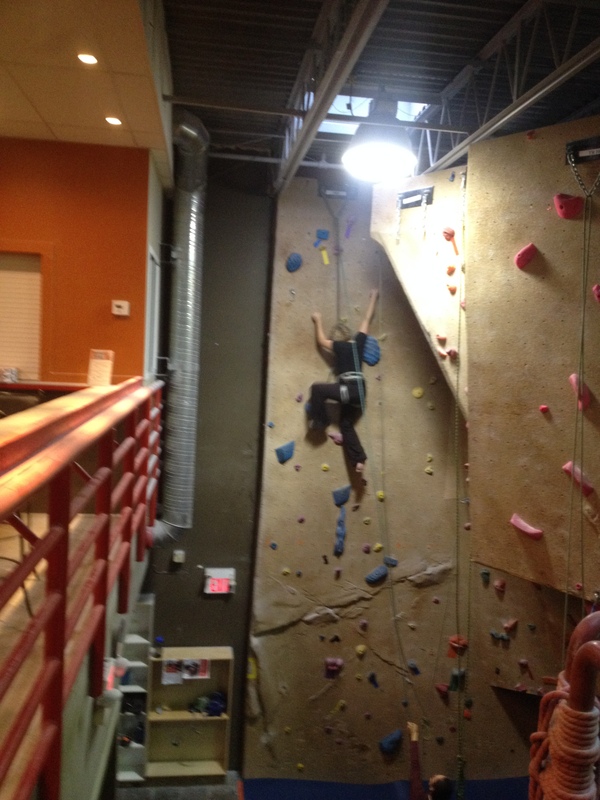 I faced the wall and started up. What a disaster that first wall was!! 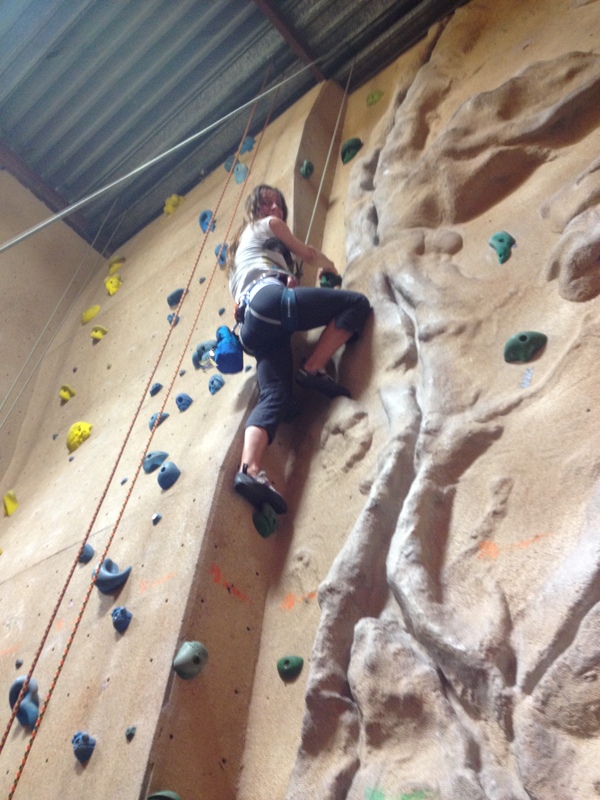 My whole body went into panic mode because I could not get my head wrapped around the idea that in order to go up I was going to have to balance on my feet and let go to reach up for the next hold with my good hand. Surges of adrenaline soon had my legs quivering and the effort of hanging on for dear life with my poor right arm soon turned it into jelly as well! 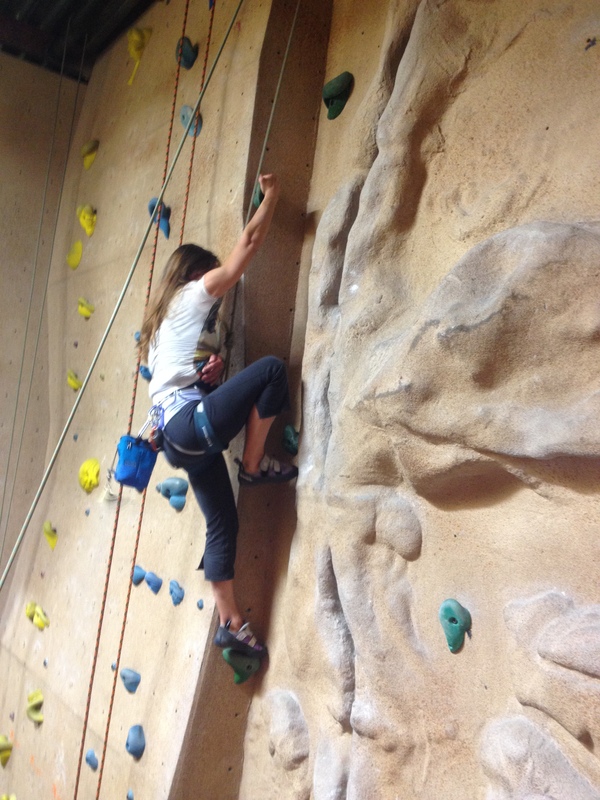 I was horrified at how hard it was, how my body was completely betraying me by panicking, how I couldn’t at all translate my usual ‘power up the wall’ climbing style into something that would work with one arm. 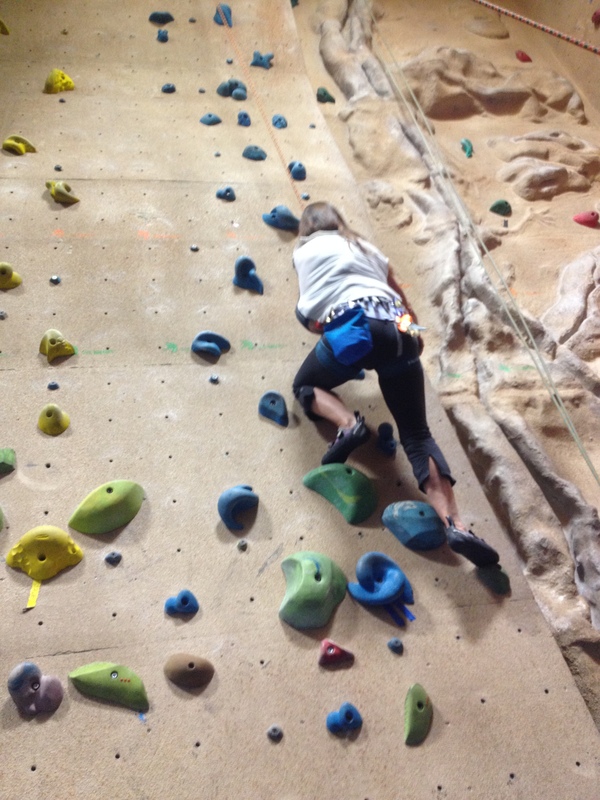 By the time I got to the bottom I was faced with the realization that either something fundamental had to change in the way I was tackling the wall or I was going to have to find another hobby to occupy myself during the long road to recovery. I confess that once I got to the bottom I felt so awful and my legs were so quivery I was ready to quit and take up tiddly winks. I sat down, had a drink, took some deep breaths and considered my options. Quit? Take a very long (two year?) break? Or, try again. I’m no spring chicken. I might not be around in two years. I decided to try again, this time on the feature wall with the cool landscaping. Things definitely improved after this. 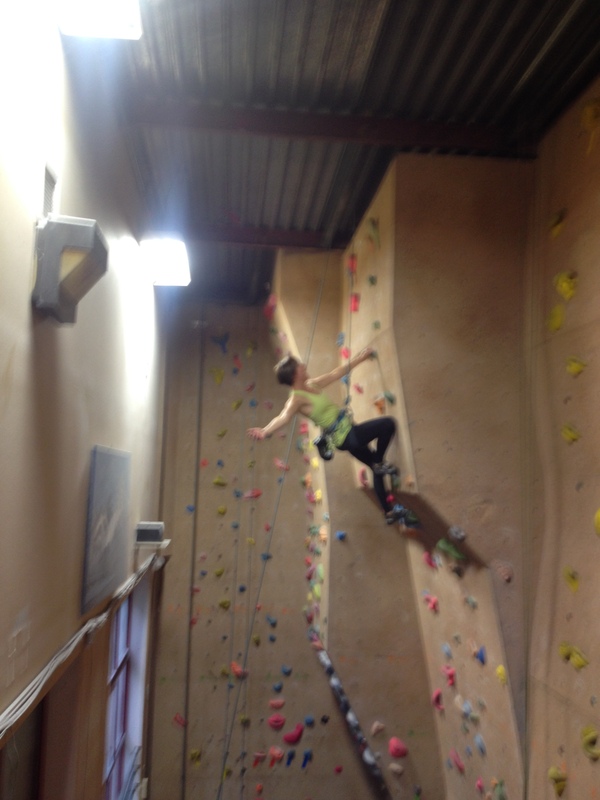 I stopped trying to leap and lunge and relied more on solid footholds, balance, and more strategic stretching. 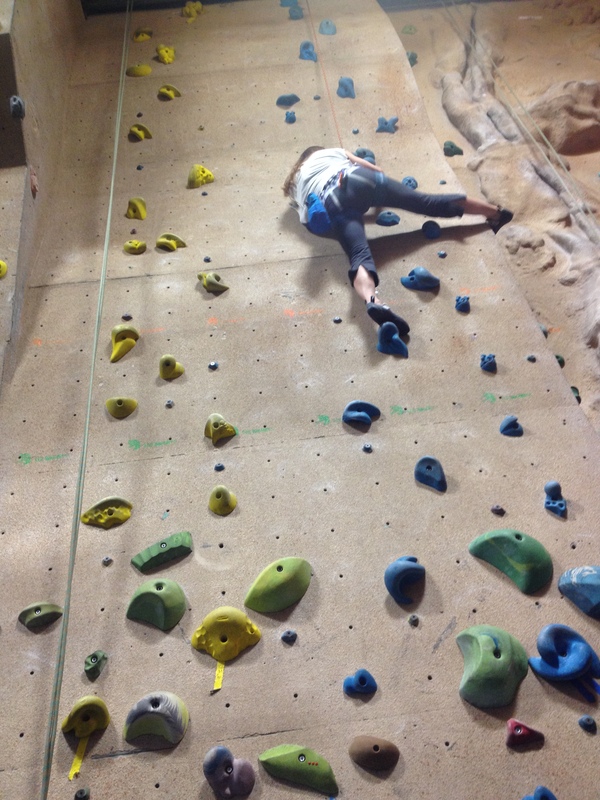 On the next wall (no photos), I was able to relax enough that I could just stand, balanced on two decent footholds and let go of the right arm, let it hang beside me to shake out and recover a moment before continuing right to the very top. By the end of the evening I was feeling like maybe there will be a way to safely climb while the arm heals and THAT was a fabulous feeling, indeed! Of course, I couldn’t have done any of this without the support and encouragement of our fantastic group of climbing ninjas – Justine, Meagan, and Charlotte. Charlotte, who has been recovering from a broken foot for what seems like forever, also tackled a wall tonight and scampered up using her two good arms (stronger than ever as a result of all that crutching and wheel-chairing she’s been doing), her good leg, and her knee! Go Charlotte!! 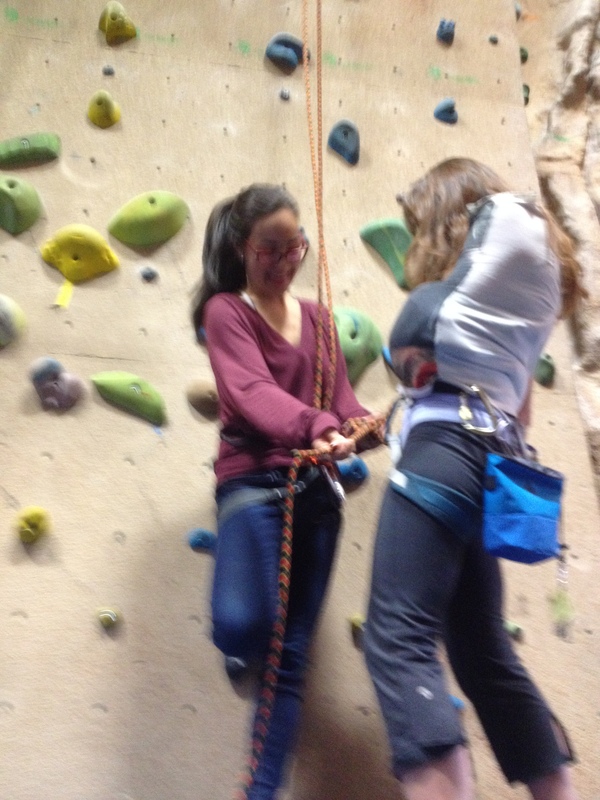 We proved tonight that three functional limbs are more than adequate to get up to the top! Poor Justine, being the only fully functional one of the evening was really made to work hard by Coach Meagan, who pushed her hard as we invalids ‘took time to recover’ between climbs. Though it’s really, really tempting to rush back to climb more tomorrow, good sense tells me a rest day or two would be a good idea before trying again. The first hurdle (giving it a try) has been conquered. Continuing to rest and give the injured arm time to heal and the over-worked right arm a chance to recover will help with the overall ‘onward and upward’ strategy that will, with any luck, see me back out on some real rock before too long! 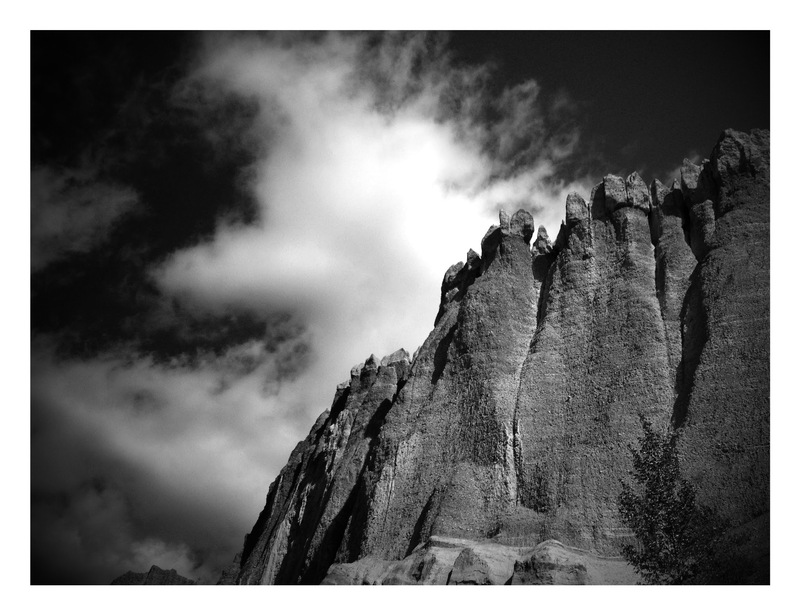 Hoodoos on one of the recent trips to the Kootenays – such gorgeous places out there to explore! 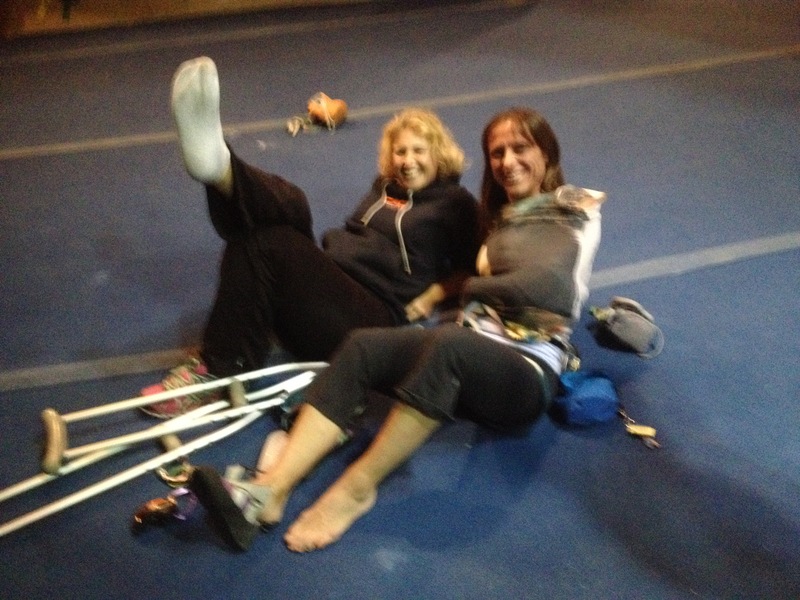 This entry was posted in Blog, Climbing and tagged climbing, injury, recovery, sport climbing, top roping. Bookmark the permalink. I’m impressed with your determination to make this work. Your injury is one that will take a long time to heal. Patience will be in order as you work out adaptations. But the possibilities are many. Thanks, Jim! I can always count on you for providing exactly the right link! It will be a long haul to fully recover, but fortunately, recovery does lie at the end of the road. 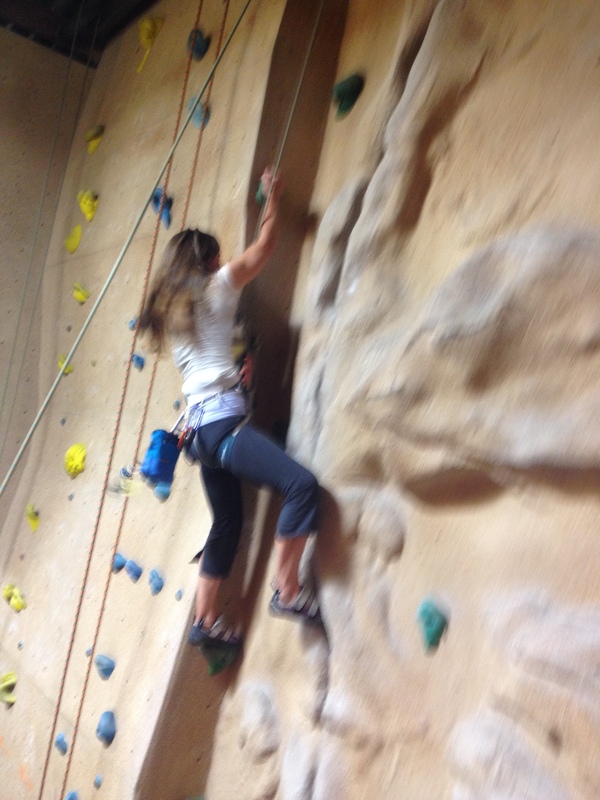 Ironically, I think this will make me a better climber as I will be forced to rely more on balance and technique and less on strength and exuberance to get me where I’m going! Hey – are you still heading to the PNW at some point this summer? Let me know when and hopefully we can coordinate a visit while you’re in the neighbourhood! Balance and technique are good to have. You’ll get there. Our son will be arriving in the Seattle area by mid-June. He keeps saying we should come out for a visit later in July or August. We are going to wait until he knows better the kind of time he’ll have available. We will let you know if it looks like a possibility. If not this time, we will go more times and make it happen. 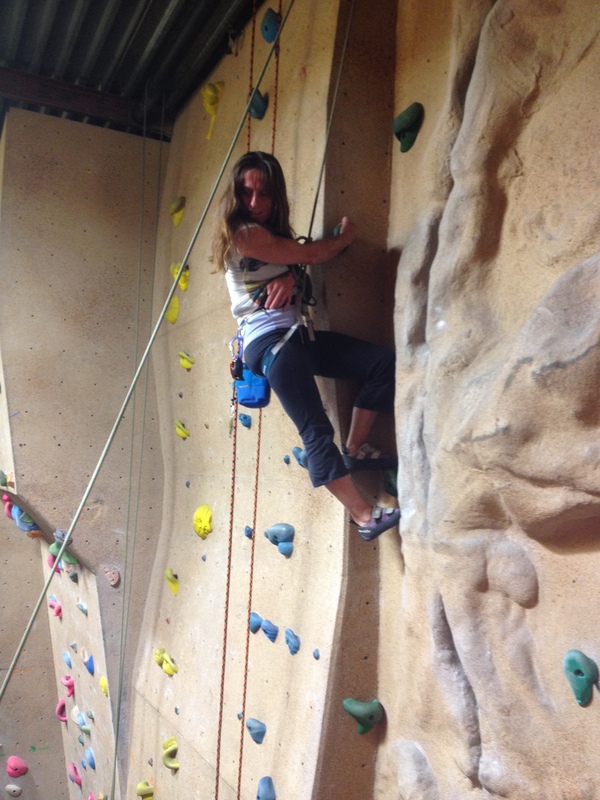 My eldest climbed almost daily for a few years, and after my two failed attempts to hit the bell on the old top roping wall, I was full of respect for her climbing prowess. To do it with one arm just is mind boggling. I saw a video clip recently about a fellow who challenged himself to relearn how to ride a bike by engineering the handle bars to steer in the opposite direction to what you’d expect. Apparently it took months to relearn the simple skill, because our brains are ingrained with the original method – his preschool age son took only 6 weeks to master the new technique. Is fear of falling part of this? I wonder. How would someone like LIbor or Seb do with one arm tied against their body? They’re strong, experienced, confident – but I bet they’d have trouble too. Very impressed with your courage and determination! That is AWESOME. So basically you’re doing research. Love it! That Orca sport series does quite decently at the library – so I imagine it sells well too. Yes, that’s it – research! Oh the sacrifices we make for our art! So inspiring Nikki. It doesn’t surprise me at all that you tackled this. Great job.